Your Ducts Could be Costing You Money! Out of sight, the condition of your household ducts shouldn’t be out of mind. Replacing or repairing ducts can improve indoor air quality, regulate room temperatures, make your home safer and save you money. Properly sealed ducts can make your heating and cooling systems operate more efficiently, helping your bottom line. Although you may not think about your ducts often, they can impact your energy consumption, safety and quality of life. Insulating and sealing household ducts is a great way to stabilize room temperatures. Many homes have certain rooms that are cooler or hotter than others, depending on the season. Often, this can be caused by leaky ducts.If you have extreme temperature differences from one room to another, or differences in dust or humidity build-up, it’s a good indication that your insulation or ductwork is not up to par. Leaky ducts can also mean your cooling and heating systems are not energy-efficient, wasting your money. This may also be an indicator that you could have unhealthy or deadly gases such as carbon monoxide circulating in your living spaces and not safely exiting your home. In order to conduct a thorough inspection of all ducts, hire a RESNET qualified EnergySmart contractor or remove all insulation surrounding your ducts yourself. If any duct leaks are found, they should be sealed with mastic or metal tape (not duct tape). Some flexible ducts may be leak-free and simply need a little straightening to be more energy-efficient. If you’re having problems locating a duct leak, blow smoke through the duct or pipe and watch for any smoke escaping. Seeing an entire duct is not always possible, so use a mirror to help you get a better look at any possible leaky ducts. 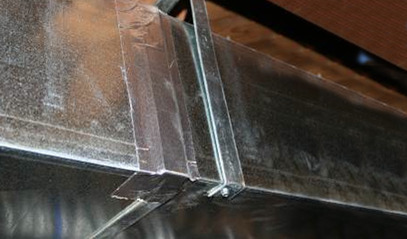 If you find multiple duct leaks it may require a complete replacement of your duct work. Moreover, following any duct examination, new insulation and a new air filter should be installed. With 50% of your energy costs devoted to heating and cooling, examining ducts is an important measure to take in order to spend less on energy. Replacing or repairing ducts can save you anywhere from 20% to 40% on home heating and cooling costs*. Homeowners are eligible for a 30% federal tax credit on the cost of equipment and materials related to repairing or replacing ducts and insulation, up to $1,500*. If you’re still unsure if your ducts need repairing, replacing or any other attention, we recommend you bring in a certified RESNET Home Energy Auditor. An energy expert will give you an accurate assessment of what duct work, if any, needs to be repaired or replaced. In addition, an energy assessment will assess the energy efficiency of your home, its features and appliances, and prioritize which retrofits are most recommended, and the expected savings and return on investment (ROI) for each. Thinking long term, upgrading or repairing duct work makes good sense, as it will save you money each month and make your dwelling more energy-friendly. Demand for HERS-rated energy efficient homes is on the rise. Discover why with this infographic!